Members should be prepared for outings by carrying a map and knowing which trails correspond to their level of ability. The maps below have been developed as an easily accessible aid for members. Contours and distances given are approximate. 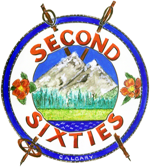 The Second Sixties Outdoor Club makes no representations, warranties, or assurances as to the accuracy or completeness of the maps found on this website. The maps can be printed by clicking on the links below.